One ton of pasta was served to the world’s best triathletes at the 2018 ITU World Triathlon welcome dinner on Wednesday 12 September 2018 at the Gold Coast. The ITU World Series triathletes were served with a carbo loading from TAFE Queensland Commercial Cookery students as they prepared 1000kg of pasta, 500kg of chicken and bacon, 500litres of pasta sauce and over 6000 bread rolls, under the guidance of Café Catalina’s Chef, Laurence Griffen and Prashant Chauhan. TAFE Queensland Commercial Cookery teacher, Reg Morgan, stated this is the first ‘live’ workplace learning integrated opportunity for the eight newly enrolled TAFE Queensland International Commercial Cookery students who make up their own ‘five nations’ - representing Brazil, China, Nepal, the Philippines and Australia. 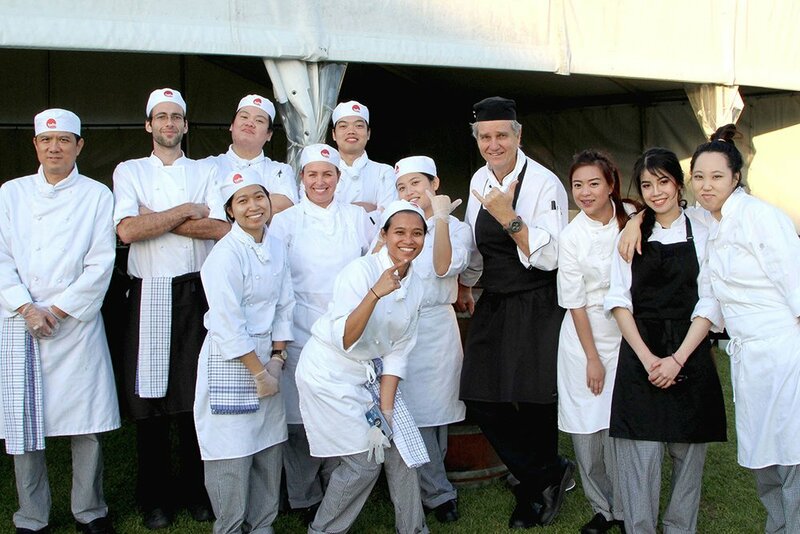 Each student will work alongside a Chef from Cafe Catalina, who have successfully catered to the highest standard of major sporting events such as the Gold Coast Marathon and the recent 2018 Gold Coast Commonwealth Games.